One of the reasons I love the outdoors is the quiet time with my thoughts. Planning a solo trip to the lake or the trail isn’t difficult, but when it comes to planning a camping trip for a large group, there are a few more steps involved. Over the years, I’ve learned how to make this process as painless as possible. 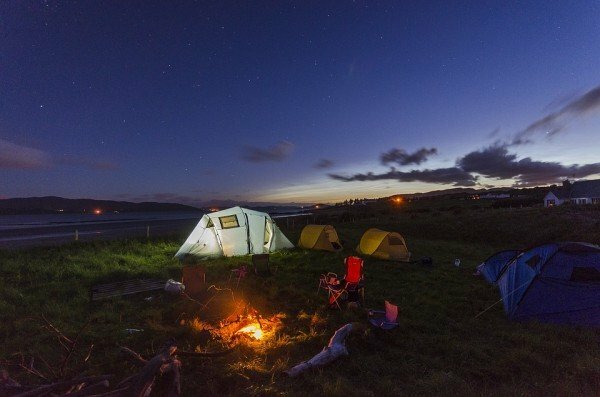 Here are four tips to help plan your next group camping trip and make your time at the campsite as stress-free as possible. Once you’ve decided on a location for your camping trip, book a site as soon as you can. Doing so may help you avoid a less than desirable location, such as being stuck with a spot next to the bathroom. Furthermore, if your group is large enough to require multiple sites, booking early ensures you can snag sites right next to each other. If possible, try to form a Facebook group or Google Doc for everyone in your group to join. This will help keep communication consistent and will also keep track of who is covering which expenses and bringing specific gear. Bonus Tip: While it can sometimes be awkward to friends and money, if you can, try to collect the money as soon as possible. With more people there tends to be more potential complications, especially where meal planning is concerned. With larger groups you have a greater chance of encountering food allergies and the like (hopefully, your Facebook group will have notified everyone of this). Take this time to decide on recipes and create grocery lists so that you’re all set well before you leave. Take a few minutes while you’re prepping and planning to review your own gear. Here’s where you’ll take stock of what you’ll bring and also what may need to be replaced. You don’t want to get to the campsite only to discover your favorite camp chair is broken. Bonus Tip: If time allows, it’s a good idea to have one or two people get to the site early to organize it.